Most first aid advice suggests putting a patient into the recovery position if they are unconscious or unresponsive, to prevent the tongue blocking breathing. 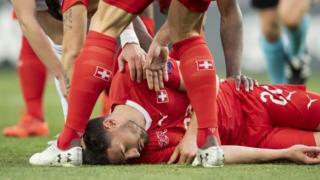 A British sports therapist, Nathan Benjamin-Smith, says it is risky to insert one's fingers into a player's mouth in such cases. Instead, he says, the tongue blockage can be remedied by tilting the unconscious player's head back and lifting his/her chin, to clear the airway.